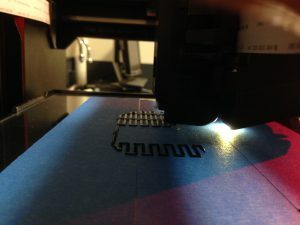 In this post we’ll describe the steps you’ll need to follow to get your print running on the 3D printer. 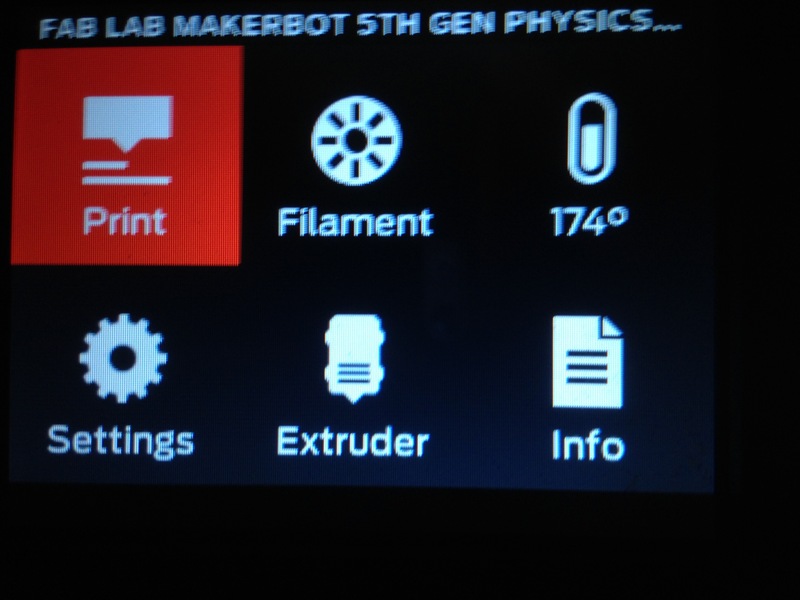 Before you can use the printer you’ll need to prepare your file using the info found here. Below are the steps listed in the approximate order you’ll want to follow. 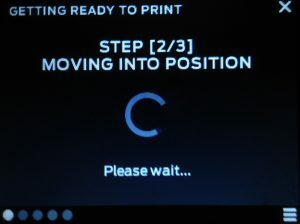 To prepare the bed you’ll need to first remove it from the printer. 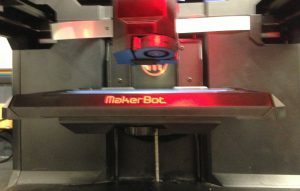 Grab it underneath the red MakerBot lettering and slide it toward you until it’s free from the support arms. 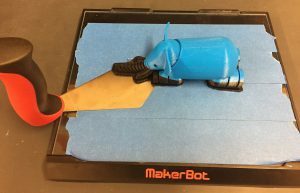 Remove any leftover tape that is on the bed and then, using an isopropyl alcohol wipe (found in the black toolbox), wipe the bed clean making sure to clean the whole area where your print will sit. 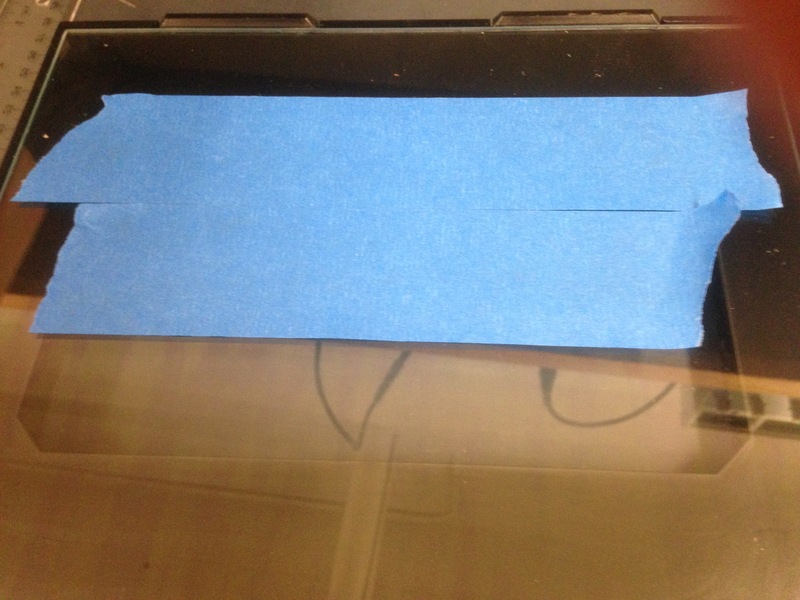 Once the alcohol has dried (a few minutes) apply a single layer of blue painter’s tape (either next to the printer or in the black toolbox) to cover the area where your print will sit on the bed. Be generous, it’s better to cover more area than less. Try to minimize spaces between pieces of tape and make sure not to overlap them either. 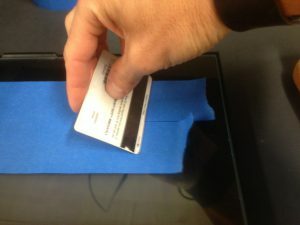 Using a piece of flexible plastic such a ruler, credit card, or piece of acrylic, smooth the tape on the bed. Use a razor (toolbox) to trim any tape that overlaps the sides of the bed. Reinsert the bed into the printer. It should slide in smoothly if properly aligned. 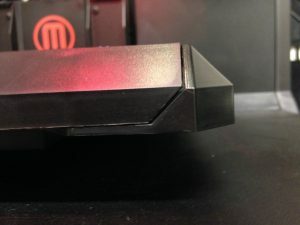 Occasionally the edges will not sit flush with the support arms so you’ll need to “snap” the edges of the arm around the bed to ensure the surface remains flat. Improper bed placement; see how it sticks up above the support arm on the right side. Make sure the bed is properly prepared and the USB drive with your prepared file is inserted into the printer. 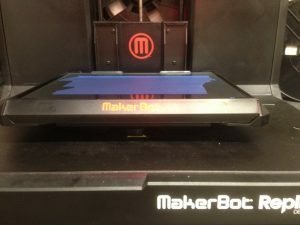 Using the rotating scroll wheel navigate to the Print tile in the display and then press the scroll wheel to select Print. 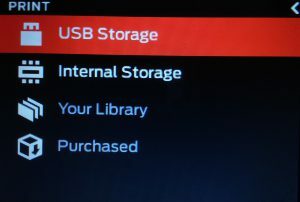 Navigate to USB Storage and click the scroll wheel to select. 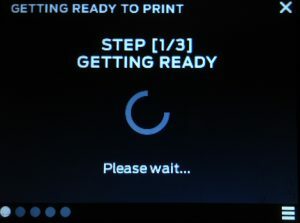 It may take up to a minute for the printer to load the files from the USB drive so be patient. Navigate to your file and click to select. 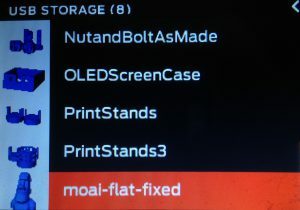 Once your file is selected you’ll get a small preview and some other info related to print settings. 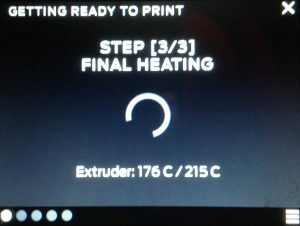 Select Print and the printer will begin heating the extruder. It will then move to the center of the bed and touch off to locate the bed height. 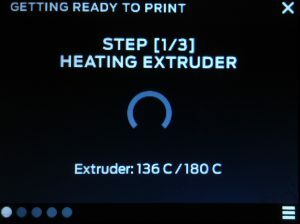 After that, it heats to final temperature, lays down a bead of material near the front of the bed, and begins printing. 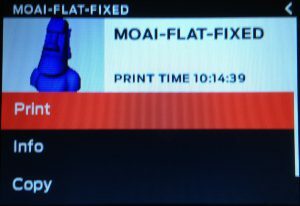 If you selected to print with a raft (generally the way to go) then it’ll start with that and, once complete, commence with your actual print. 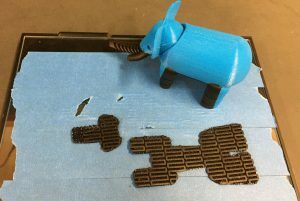 Unless the raft is huge then we recommend you stick around to see that it completes the raft and begins laying down your print. 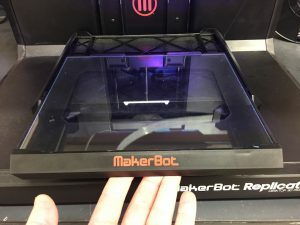 It should only take 10-15 minutes for it to complete the raft and, if there were going to be issues, they would likely arise during the raft printing. 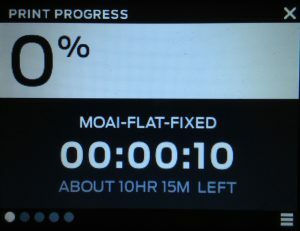 Once the raft is done and it’s printing away you can check the display for an estimated print time and percent completion. 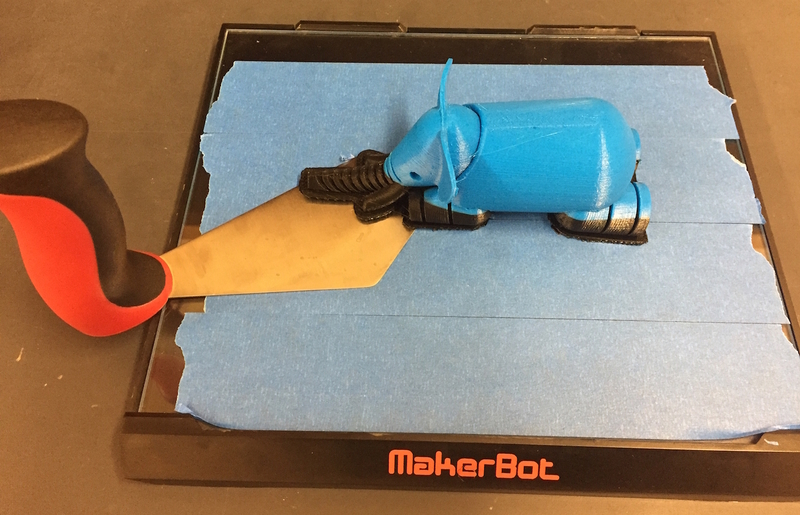 Congratulations, your print finished! At this point you’ll need to get it out of the printer. Start by removing the bed from the printer. Make sure the bed is on a stable, flat surface. 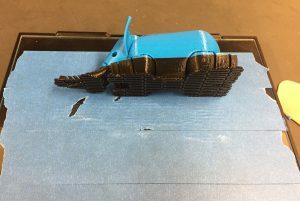 Insert one of the edges of the print removal tool (red and black handle) under the raft on your part (but above the tape) and begin to wiggle it back and forth to work it further under. Don’t force it all at once, just slowly wiggle it under. Do this in a few spots around sides of the raft. 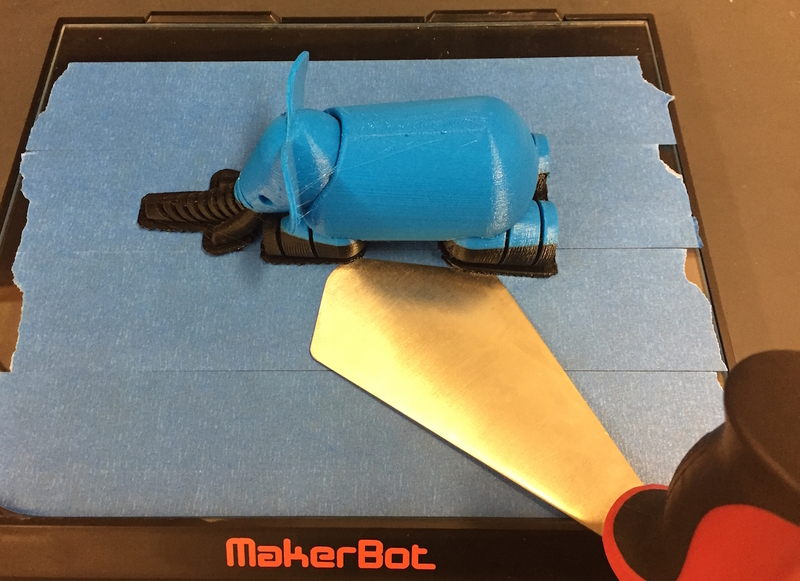 Once you’ve gotten the edge of the tool a little bit under the raft (1/4″ or more) you can lift the tool up which will start to dislodge the print from the raft. Be careful here as PLA is fairly rigid and may break if bent too sharply. Do many small lifts to fully dislodge your part, it should snap free after a few tries. With your part free you just need to remove the raft from the print. The raft can be broken free without any tools. Start pushing the edge of the raft back from your part and work your way around. It should start to break free and then will snap off quickly. Again, be patient and work all the way around the part before applying too much force. 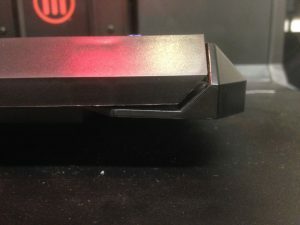 The tape will likely get damaged in the process. After your part is free just peel off and dispose of the tape and insert the printer bed back into the printer for the next person.